Mark your calendars. The ASUS ZenFone 5 series is coming this April 14. The ASUS ZenFone 5 will be launched in the Phililippines on April. The company wants you to mark your calendars as the company announces the local unveiling of the popular handset which came to light in Mobile World Congress in Barcelona. 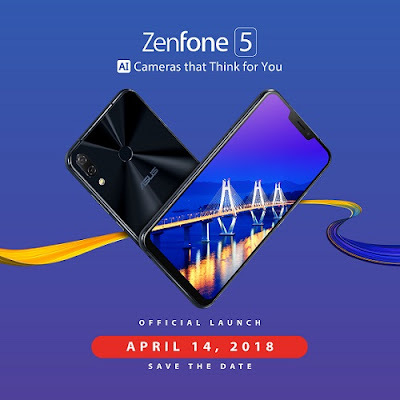 ASUS Philippines now gives ZenFans all the more reasons to celebrate with the much awaited confirmation on the arrival of the ZenFone 5 series in the country. For its local launch, ASUS Philippines goes #Backto5 as a nod to an entire heritage of strong mobile photography-centric smartphones. 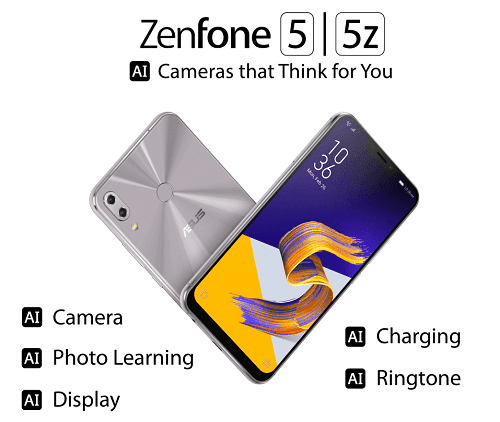 And this time around, the newest ZenFone 5 series does not only feature premium designs but also champions mobile photography anew with the latest Artificial Intelligence (AI) technology. ZenFone 5Z is an exciting next-generation 6.2-inch, dual-camera smartphone that comes with a beautiful 19:9 all-screen display (ASUS’s first-ever phone to have this feature) featuring a 90% screen-to-body ratio, packed in a 5.5-inch body size. It’s also the first-ever ZenFone model to harness the power of the latest Snapdragon 845 Mobile Platform with AIE, featuring a 3rd Generation AI platform that includes the Hexagon 685 Vector DSP, Adreno 630 Graphics, and Kryo 385 CPU. ZenFone 5Z also benefits from the Snapdragon X20 Gigabit LTE modem, delivering speeds that surpass the gigabit barrier for a 'wireless fiber' experience, as well as integrated 2x2 802.11ac Wi-Fi and Bluetooth® 5 for ultra-low-power wireless earbuds. The extreme-performance ZenFone 5Z comes with 6GB RAM and 64GB ROM, offering breathtaking performance combined with outstanding energy efficiency for long-lasting battery life. ZenFone 5 features an exquisitely crafted design, an amazing dual-camera system, and is powered by the latest Snapdragon 636 Mobile Platform. For an instant blast of extra power, the exclusive ASUS AI Boost (also available on the ZenFone 5Z) optimizes performance for games and other demanding tasks. The ZenFone 5 features intelligent dual-camera systems that adapt and learn, delivering perfect photos every time. Equipped with the latest flagship Sony® IMX363 sensor with large 1.4µm pixels, an f/1.8 wide-aperture lens, 120° wide-angle secondary camera, four-axis optical image stabilization (OIS) and AI-enhanced camera features — including AI Scene Detection for 16 different scenes and objects, AI Photo Learning, Real-time Portrait and Real-time Beautification — ZenFone 5Z and ZenFone 5 encourage creativity and free the user to concentrate on the subject rather than the camera. 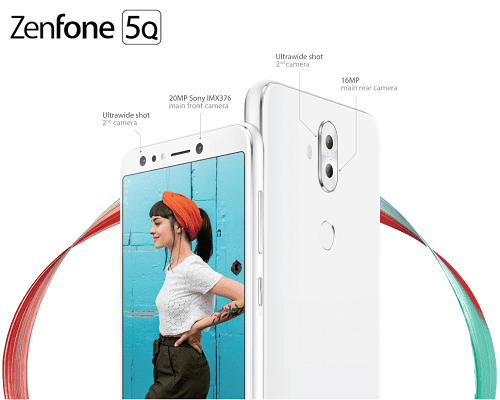 The ZenFone 5Q is a stylish 6-inch smartphone featuring the world's first globally-announced true quad-camera system with high-resolution and wide-angle cameras at both front and rear. ZenFone 5Q removes the limits on photographic creativity, with a high-resolution main camera — 20MP Sony at the front, 16MP at the rear — and, uniquely, a secondary 120° wide-angle camera at both front and rear. Unlike rival systems, each camera works independently every time for perfect selfies, wefies, landscapes, portraits or groups shots. Powered by the Snapdragon 630 Mobile Platform, ZenFone 5Q combines incredible performance, optimized power efficiency and a 3300mAh battery with advanced security and convenience features — including NFC, triple-slot SIM/microSD card holder, rapid face unlock and fingerprint recognition — for a mobile experience like no other. The ZenFone 5 series has sparked the interest of many, and without a doubt this particular ZenFone generation pushes the envelope; especially with ZenFone 5Z and ZenFone 5 being dubbed at the first ever line-up of most Intelligent ZenFones. Full specs, pricing, online reservation of units and the bundled freebies will be announced in the next few days, so stay tuned!